You will get a variety of cheeses. Not just Cheddar and Colby. Go for some Neufchâtel or maybe some Roquefort. Skip the “American Cheese”. It’s not cheese. Stop calling it that. Is it all dairy and rodents or specifically mice and cheese? So, no problem with a rodent using mind control but the inaccuracies of cheese preferences are too absurd? Aside from the (also inaccurate) stereotypical mouse hole, how would the joke work out using breads, vegetables, etc.? 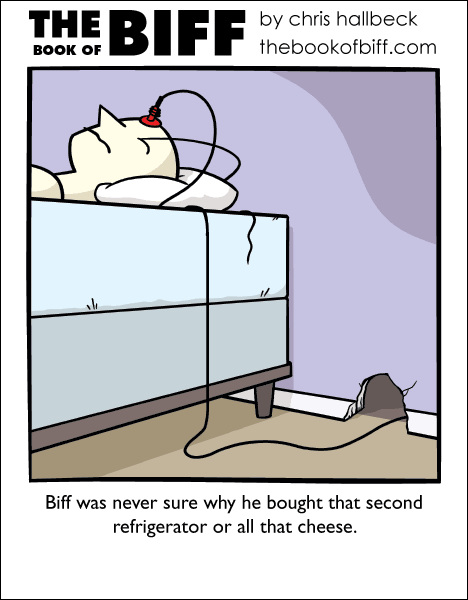 What I find most funny, though, are all the well-placed cheese ads on all these cheese related comics. The power of technology, eh? I just wrote those jokes dont work for *me* anymore. And the cheese ads are just google’s way of trying to influence you. or rather the companys that bought a spot on google’s adSense reel. Ironically, from what I’ve read rodents don’t actually like cheese that much – it just used to be almost the only thing in the house they could get to easily. Mom has told me that mice like sausages, potato chips, chocolate and candy. Or, at least the mice that would appear at the gas station where she used to work. The mice ate that. I like most cheeses, even American. But then again, my people knew not of any cheesy goodness until you wacky Europeans crossed the ocean and brought dairy cattle here. Ask a convenient Native American about Government Surplus/Commodity Cheese, and more often than not, they will wax practically poetic about it. Even though Lactose Intolerance runs (ha!) somewhat in our peoples, we will body-check nuns and orphans for a block of “Commod” cheese. American cheese-like food product — pass! Trader Joe’s has a Dubliner that’s pretty intense and interesting; even my wife ‘Non-Dairy Donna’ likes it (when she doesn’t have to sing). It’s an allergy, not lactose-intolerance, and some of the local Mozzarella (but not European somehow) and lighter varieties are OK. I was born in Switzerland and still live there. If I go hiking in the mountains I often buy cheese directly at the producers on alp. The cows feeds various natural grown herbs and grass instead of silage and concentrated feed. Believe it or not, but you can taste that in the cheese! It is rich of various flavours and strong in taste. Just delicous! Btw, did you ever tasted cheese made from sheep or goat milk? Yeah, goat cheese is great! Id believe you. Ive eaten chicken that wasnt factory bred before and you can taste what they eat when the final products placed at the farmers table. “it tastes like chicken” because chicken can taste like pretty much anything you feed it, feed it fishmeal: fishy chicks. I’m going to feed my chickens bacon. I live in Switzerland, too, and got rather confused: First though “Neufchâtel” was just a misspelling of Neuchâtel (a city in Switzerland, called “Neuenburg”* in German). Though, although many Swiss regions, towns and villages have their own cheese varieties named after them, I didn’t know of any internationally known cheese to which Neuchâtel might have been namesake. Turns out Neufchâtel is the name of other places in France and Canada and the cheese originates from one of the French ones. *There’s other places called “Neuenburg”, too, though.